Tall street lamps with hanging lanterns light up the Santo Domingo square in Oaxaca, south-east Mexico. Home to Mexico’s most vibrant crafts and art scene, some outstandingly colourful festivals and diverse natural riches, this is where my wife Erica and I currently call home. Before Mexico, our home was in a variety of different destinations including Malaysia, Costa Rica and more. We were running a zoo on Brisbane’s outskirts for 22 years before we started to think more about lifestyle than work and money. After the Global Financial Crisis almost wiped us out, we picked ourselves up and decided to research places in the world where we could afford to live. In early 2015, we bought one-way tickets to Kuala Lumpur to explore Malaysia and Southeast Asia. Our primary aim was to checkout countries that would allow residence for Australian retirees. 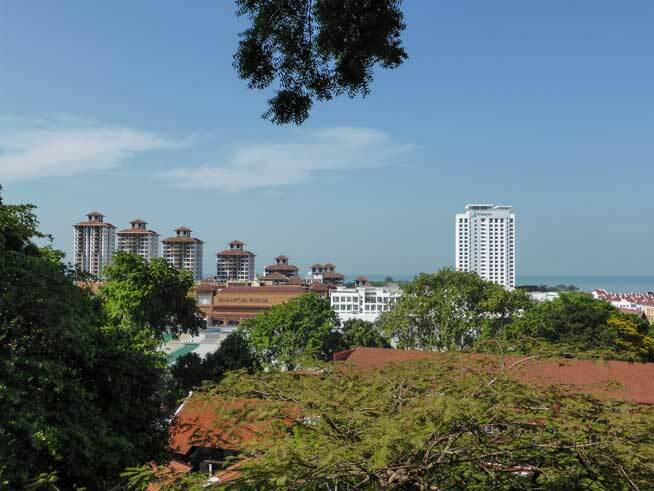 Malaysia has a My Second Home program and is an easy place to get residence. It has good healthcare in private hospitals and is less than half the cost to live compared to Australia. Over three months, we explored from Langkawi in the north to Malacca in the south. We also visited Penang and Ipoh. We loved our time roaming Malaysia and realised we are true nomads; we don’t need to settle in one place. By travelling “slow”, we get to know the country we are exploring in depth and are able to manage costs. Take Malaysia for example. We discovered that most of the private hospitals here have western standard facilities and cost little more than a hotel room for an overnight stay. We liked Ipoh for its food but its climate is too hot for us at 35 C most days. Our favourite dish was bean sprout chicken at Tauge Ayan Lou Wong. The chicken is served in one dish and topped with lots of chillies, and the crunchy bean sprouts are served separately. The place is always packed and the cost for two is only $6.70. We used Malaysia’s inexpensive bus system to head south to Malacca. This cost only $13.28 each and the journey took about six hours on a very comfortable bus. We spent three weeks living as Malaccans in a brand new apartment building called The Shore. The apartments here are normally fully furnished, and leases are 12 months. However, we got a special three-week rental deal in an unfurnished tower by talking directly to the developer. We paid $420 a week for a brand new three-bedroom apartment on the 17th floor. Their proximity to the tourist attractions without being right amongst them, makes them ideal for retirees like ourselves. During a month in Sri Lanka, we discovered that it ticked all our boxes as a place to retire. Excellent, affordable healthcare, great climate, friendly people, wonderful food and cheap housing. Cheap flights with Air Asia meant friends and relatives could visit, and it would be cheap for us to visit them. Retirees can get easy residence and an up-market lifestyle is affordable here. One of the best things about Sri Lanka was the food. Breakfast included a sambal (hot sauce) of chopped red chillies, salt and lime juice, served with rotis. Dahl was served with all meals. There were always five dishes for dinner including dahl, swordfish curry, several vegetable curries and sambals. Red rice was served every day. The dahl and breakfast sambal were our favourites. In Kandy, in central Sri Lanka, we paid about $10 a day each for full board and food. You could rent and live well here for $1,400 a month. In Galle, on the southwestern tip, our host fed us for no charge and allowed us to be in the kitchen whilst his wife and he jointly prepared the dinner. We loved hoppers—a dish based on a fermented batter usually made of rice flour and coconut milk with spice—with eggs in them for breakfast. Next we headed to East Bali, away from the tourist spots to Sideman and Amed. We stayed in a beachfront bungalow overlooking the Bali Sea and Mount Agung. For $37 a night, we felt like we were living in paradise. Our bungalow was traditional Balinese with bamboo ceiling and open eaves. We felt taken back in time. Sideman is the “Old Bali” where people farm the same way they have for centuries. In Guatemala, Central America, we stayed for three weeks in the colonial gem of Antigua, in the south, discovering the food, lifestyle, cost of living and private medical care. Here we had access to a kitchen and cooked fresh local market vegetables, local-style, with lots of chilli. The markets are huge and have every type of food imaginable at low prices. Residence in Guatemala is easy—you just need to pay a fee and prove that you have an adequate income from outside the country. Once obtained you can move freely through the Central American countries of El Salvador, Honduras and Nicaragua with no need for a passport. After exploring Tikal—a Maya ruin in Northern Guatemala about 30 minutes from the ancient town of Flores—and the beautiful Lake Atitlan in the west, we headed to Copan, Honduras. Copan is a famous Maya ruin—we approached through the jungle with scarlet macaws flying above us. They were sacred birds for the Mayas. We explored a little-visited area that has the best preserved hieroglyphics. From Guatemala we took a bus to Leon in Nicaragua. Leon has a very warm climate with average temperatures in the mid- 30’s. Just 20 minutes away is the Pacific Ocean, with its sea breezes making it a delightful place to stay for two weeks. Not many cities have a beach that close. Leon is also a university town and has much history to discover. We loved it. Our favourite thing was climbing to the rooftop of the Leon Cathedral. It had just been painted white and gave us a surreal feeling as we walked around the giant domes with views of volcanos in two directions. We wanted to explore the rainforests of Monteverde in Costa Rica. Whilst the rainforests were remarkable, the cost of living was high. All prices were in U.S. dollars, and the Australian dollar was only 70 cents against the U.S. dollar at the time. We spent a week in San José the capital of Costa Rica, before the cost became prohibitive for us. We hopped a plane to Mexico City to reduce our daily costs. It was a fascinating place, and we spent three weeks there familiarising ourselves with the country. The Metro is fantastic, with trains on rubber wheels every three minutes. Only 40 cents to anywhere on the network. We stayed in a one-bedroom apartment in Amigo Suite, just off the Zocalo—the main square in Mexico City—for 20 days. This cost us only $48 a day including breakfast and dinner. The highlight was climbing the 65-and-a-half metres to the top of the Tetihuacan Pyramid of the Sun outside Mexico City. Over 2,000 years old, it’s third largest in the world. For us this is just the beginning. We have only visited about 50 countries; there are still 150 left for us to explore. Soon we are heading off to the Balkan states, then to Sicily, Sardinia, Corsica and Malta. Our advice is to “Seize The Day!” and get out there and do it. If we can you can too. We have spent the last 12 months refining our travel “model”. Homework has been the key to travelling cheaply. Some places we visit are costlier than others, so we try to mix them up to get an acceptable average. As we do not plan very far ahead, we can change countries if we find it too expensive, as we did recently when we left Costa Rica for affordable Mexico. So far, we have mixed cheaper Southeast Asian destinations with Central American ones. The Balkan States look like they will fit into our budget, but Sardinia and Corsica look more expensive. If the costs get too high, we plan on flying to the Philippines and Burma. We are great fans of Excel spreadsheets, and fill ours in everyday to monitor costs. We use just three columns—accommodation, food and travel costs. We calculate each day our total costs and over time we get the running average cost per day. If we find it is going too high, we identify that early and look for savings in the days ahead to pull it back down. Very simple but effective! Our golden rule is to keep average accommodation to a maximum of $50 a day. This requires many hours of research to achieve, but time for us is plentiful. We use Booking.com extensively as we can make a booking to cover ourselves and then keep searching for a cheaper place. We book somewhere with no cancellation fees in case we find somewhere more affordable before arriving. Having made so many Booking.com reservations we always get the best rooms and often upgrades. We also always read all reviews of places we are considering. Travel insurance has been one of our greatest challenges as I am 71 and Erica 68. By reading the fine print of the free policies that came with our credit cards (NAB and American Express) we discovered that we can get cover, provided as we return to Australia every six months. So after each six-month travelling period, we return to Australia for six-weeks before setting off again on another six-month trip. By travelling “slow” we fly when the airfares are at their cheapest, and we are happy to go “the long way” to save money. Overnight bus trips, as well as being affordable, mean no accommodation costs for a night. In How to Retire in Paradise from $40 a Day we’ll introduce you to five of the most attractive and exciting retirement options, destinations and opportunities in the world…and you can retire to any of them for less than it would cost you to stay home. Subscribe to International Living Australia today and you’ll save 29% and receive this report for FREE.